‘Tenant for Life’ is a relation of the step-by-step uncovering of an old mystery – why would somebody need to buy a baby in a hurry? (Note that it’s the hurry that’s the initially suspicious thing about the transaction, not the whole buying a child thing: ‘Children are not bought in the dark in the midst of fear and trembling, if all is clear and honest sailing.’). ‘Georgy’ is the story of a plausible young man’s bare-faced swindling of his careless employer (and his escape). ‘Murder or No Murder’ is closely based on the real-life Road Hill Murder case, which also inspired The Suspicions of Mr Whicher (this story features another detective, Hardal, ‘the most eccentric barrister at the Bar’, who I would have liked to meet again). ‘The Unknown Weapon’ sees Miss Gladden solving the murder of the feckless son of miserly Squire Petleigh – killed with a strange piece of metal. ‘The Mystery’ is not of a piece with the others, being a semi-farcical tale of the elopement of a young couple. DEDUCTION.–That a foreign man, of age, but not aging, was murdered by stabbing by the members of a secret foreign society of educated men which he had betrayed. That this murder was committed by lodgers and most probably on some other floor than the basement, and of a house situated in the Soho district. Arrived at Tram at once I found the constable, and I am constrained to say-a greater fool I never indeed did meet. She was not pleasant to look upon, her jaw being so underhung as to give her at first sight that malevolent expression which is too suggestive of the bull-dog. Even when I am engaged hot in a case, I am afraid I relax on a Sunday. In summary, Miss Gladden is an implacable foe to the criminal, a proper deductrix (I may have made that word up), and a worthy ancestor of modern-day female detectives. 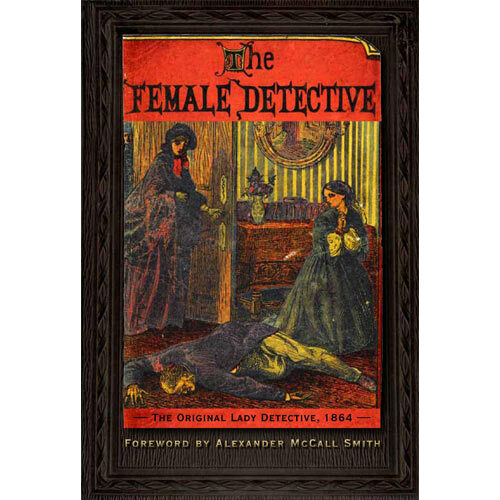 The book isn’t as rambunctious as Revelations of a Lady Detective, but it is probably a more significant work in the history of the genre. I am entering The Female Detective in the Vintage Mystery Reading Challenge, in the Genuine Fakes category. The Introduction to this edition tells us that ‘Andrew Forrester’ was a nom de plume of James Redding Ware, who also wrote books on subjects as diverse as card games, dreams, famous centenarians, English slang and the Isle of Wight. This entry was posted in 2013 Vintage Mystery Reading Challenge, British Library Crime Classics, Classic mystery book review, Witness Statements and tagged 1860s, Andrew Forrester, classic crime fiction, crime, UK, Victorian. Bookmark the permalink. Rich – I’m so very glad you highlighted this novel. It was groundbreaking and even today there are aspects of it that hold up. These look like very nice editions, it’s the kind thing of which I’d like to see more being done. Yes, they’ve done a nice job. This one is scanned, whereas they re-keyed ‘Revelations’, but both books feel high quality. And please forgive that garbled sentence I typed, eek. I’d better get some coffee. I had read a review of this, last year I think, where the reviewer was less that charitable towards the book, mainly, I think, based on todays norms. Her review of it made me curious to read it, your review has cemented that idea in my head. Thanks for the review.